Ross O'Doherty of Clare celebrates his second half goal against Waterford during their minor championship game at Cusack Park. Photograph by John Kelly. 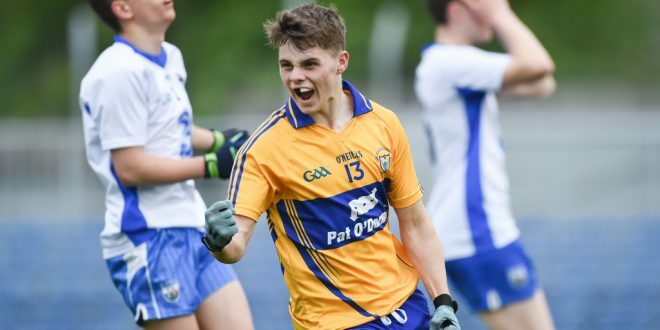 THE Clare minor footballers eased to a 20-point victory over Waterford in Cusack Park on Wednesday evening in a Munster championship play-off. 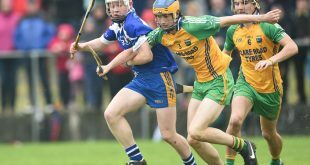 The Seamus Clancy-managed team will play Tipperary on Wednesday evening next in their second play-off, to determine who will advance to the provincial semi-final. Clare were lethargic for large parts of the first half but they exploded into life once Ross O’Doherty goaled 17 minutes from time. He picked up a break off Diarmuid Ryan and finished clinically. O’Doherty netted again in injury time while, in the interim, Corofin’s Gearóid Cahill completed a superbly executed hat-trick of goals. 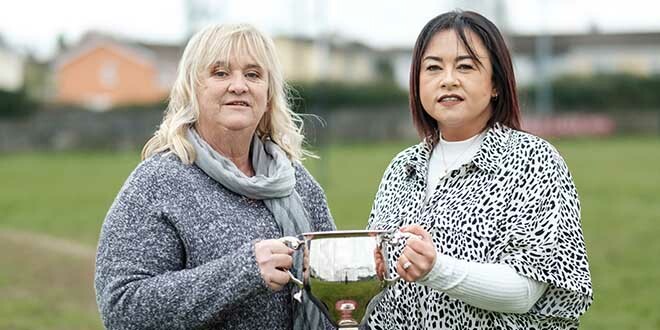 Playing in front of an attendance of 389, Clare started with impressive intent. They had 1-2 on the board inside four minutes and Waterford looked out of their depth, even at that early stage. The home county won the throw-in and attacked immediately, with Seán Rouine pointing after a mere 22 seconds. Ross O’Doherty followed shortly afterwards with a nifty left-footed point. Clare won the resulting kick-out, centre-forward Dermot Coughlan picking up the breaking ball in the middle of the field. The ball was transferred to corner-forward Gearóid Cahill, who calmly finished a lovely move. As impressive as they were in that opening spell, Clare were outplayed for the remainder of the half. Waterford began to win possession in the middle third and were it not for some very poor shooting, they would have led at half-time. In fact, the visiting county kicked eight wides, six in succession, after Tom Barron put over their third point from a free. Barron had already pointed from a dead ball, while midfielder Mick Devine was the first and only Waterford man to score from play in the ninth minute. Clare wing-back Diarmuid Ryan won a 10th minute kick-out and went on a surging run, cutting through Waterford. He was fouled and Gavin Cooney pointed the free. That was Clare’s final score of the half, yet they still managed to lead 1-3 to 0-4 at the interval. Waterford employed corner-forward Tom Barron as a sweeper from the off, while Joe Miniter was Clare’s spare man at the back in the opening half. Dermot Coughlan, who was much more involved in the second half, White won ball and ran at Waterford, who only managed a single point from play in 60 minutes of football. Tom Looby’s late penalty hit the crossbar and Mark Lillis saved the rebound. Along with Coughlan and White, Jack Sheedy and Diarmuid Ryan also excelled for Clare, while the finishing of Cahill and O’Doherty was top class. Clare: Mark Lillis (Cooraclare); Joe Miniter (Kilrush), Jayme O’Sullivan (Wolfe Tones), Jack Sheedy (St Breckan’s); Diarmuid Ryan (Cratloe), Fergal Donnellan (Cooraclare), Colin McNeilis (Clondegad); Conor McMahon (Cratloe), Danny Griffin (Éire Óg); Seán Rouine (Ennistymon), Dermot Coughlan (Kilmurry Ibrickane, captain), Ross Phelan (Kilrush); Ross O’Doherty (Ennistymon), Gavin Cooney (Éire Óg), Gearóid Cahill (Corofin). Subs: Ciaran O’Donoghue (Cooraclare) for Ross Phelan (24), Keith White (Inagh-Kilnamona) for Dnny Griffin (half-time), Aaron O’Brien (St Breckan’s) for Colin McNeilis (47), Rian Considine (Cratloe) for Gavin Cooney (51), Aidan McNamara (Michael Cusack’s) for Conor McMahon (55), Colm O’Brien (St Breckan’s) for Gearóid Cahill (59). Scorers: Gearóid Cahill (3-0), Ross O’Doherty (2-1), Dermot Coughlan (0-3, 2f), Seán Rouine (0-2), Gavin Cooney (f), Jack Sheedy, Diarmuid Ryan, Rian Consisdine, Ciaran O’Donoghue (0-1 each). Yellow cards: Diarmuid Ryan, Seán Rouine. Waterford: Aaron Beresford; Michael Horgan, Dale Cullinane, Sam Murphy-Nix; Mark Twomey, Shane Ahern, Conor Kilgannon; Mick Devine, Conor Cullinane; Tom Looby, Dan Booth, Seán Whelan-Barrett; Stephen Curry, Darragh O’Keeffe (captain), Tom Barron. Scorers: Tom Barron (0-4f), Mick Devine (0-1), Tom Looby (0-1f). Subs: Brian Lynch for Darragh O’Keeffe (41), John Devine for Conor Kilgannon (46), Reece Stringer for Michael Horgan (55), Niall Dunphy for Seán Whelan Barrett (56), Reece Power for Stephen Curry (57).